Who would have thought that a bunch of intersecting lines of various widths, colours and spacings, first devised to delineate different highland clans from one another, would become one of the most plundered fashion tropes of all time? Perhaps it’s the geometric simplicity of checks, plus the almost infinite colour combinations, that have made this pattern an permanent name on fashion’s team sheet. On the other hand, if you understand the rules of engagement, checks have a good habit of making you look refined by default and it’s a partnership you’ll covet for the rest of your life. Despite the huge variation of checks available, there’s no need to overcomplicate matters. These are the five key styles to check off your list, each very different from the other in both looks and deployment. A neat, tight check pattern that becomes almost mottled to the eye at distance, gingham is typically a medium-weight plain-woven cotton yarn, although in the summer you’ll see plenty of linen blends. Thought to have originated in northern France, gingham was made almost exclusively by Manchester mills in the 18th century. Popularised by mods in the sixties, it’s nevertheless suitable for work and play. Its colours are often bright, which makes it a good option for layering. As the name would suggest, Prince of Wales check (also known as Glen plaid or Glenurquhart check) has royal heritage. Defined by large squares that typically combine black- or brown-and-white check with a vein of contrasting blue, pink, red or green overcheck, it’s commonly believed that it derives its name from the slick-dressing Duke of Windsor when he was known as the Prince of Wales. In fact, it was his grandfather Edward VII who had the penchant for the fabric. It’s one of the most versatile and easy-to-wear patterns in the check squad, lending itself beautifully to laid-back suiting but also outerwear in the form of tailored winter coats. The magic of PoW lies in that contrast overcheck, which allows you to harmonise the colour with other parts of your look. If PoW check is the good-looking, hardworking older sibling, then windowpane check is the younger brother who loves getting all the attention. Make no mistake, with its contrast white squares it’s a loud, bold, statement of a pattern, a feature that makes it notoriously difficult to wear as separates. Hence if you’re going to wear windowpane, stick to suiting in a soft flannel cloth. There are over 400 tartan styles, and they started out as a means for Scottish clans to set one another apart (before they tore each other apart). Later, Scottish estate owners would develop their own to camouflage themselves during the shooting season, picking colours from the landscape around them. These days, tartan still plays a part in contemporary collections thanks in part to Burberry’s iconic motif and tartan’s adoption by the punk movement in the seventies. It’s also a signature of Vivienne Westwood and pops up everywhere from Barbour to Palm Angels. And therein lies the secret to wearing it – in pops of accessories or used in patchwork fabrics. Not full look tartan army like the Bay City Rollers. 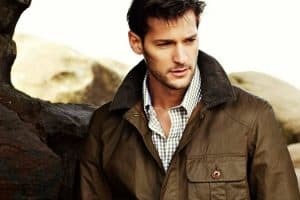 Buffalo checks have been trending hard in recent years, the pattern finding a natural home on workwear- and outdoors-inspired pieces like flannel shirts and chore jackets. Yet where it comes from is hotly disputed. On the one hand, Woolrich claims to be the originator of the bi-colour, square block check; while on the other, a man called Big Jock McCluskey is said to have brought the cloth from Scotland to the US. He supposedly used it to barter for buffalo pelts with Sioux and Cheyenne tribes, hence the name. Apocryphal or not, it’s a great tale and an even better fabric for casual shirting. Every man should have at least one check suit in his formalwear line-up, whether it’s for a job interview or you just need to impress upon someone a degree of self-assurance. If there’s one category of clothing upon which you can afford to let the checks loose it’s outerwear, particularly tailored overcoats, says Alex Field, head of menswear at Reiss. “At the shows earlier this year, the fashion pack were all over this look, partnering bold check overcoats with a variety of ensembles from all-black minimal outfits to hype streetwear. Checks are a great foil to a plain suit. Gingham, with its tight check configuration, is particularly effective when employed as a bold contrast to a charcoal or navy suit – blue gingham is the safe option but don’t discount a red style provided you can match it with a high-volume tie. Alternatively, a simple white shirt with a faint windowpane check offers a nice contrast to a pinstripe suit and you could also wear it with a striped tie to field a mash-up of contrasting lines. Pattern mixing is advanced styling but this is the simplest way to do it well. Besides the tie, formal options for check accessories are effectively limited to pocket squares in the summer and scarves in the winter. However, casualwear offers far more options, none more so than the Burberry cap, which has had a resurgence in recent seasons. Hats, rucksacks, totes and holdalls can all be useful ways to pattern clash. Just avoid syncing the checks of your accessories with the checks of your clothes unless you’re receiving monetary compensation for doing so – it’s never a good look. By far your easiest, most wearable option, casual check shirts have been on fire for the last couple of seasons and although they’ve been around for generations, streetwear heavyweights like Off-White and Palm Angels are breathing new life into buffalo check shirts and overshirts. Much like the check overcoat, a buffalo plaid shirt is inherently versatile: wear it with faded jeans and a T-shirt for a retro-inspired aesthetic or use a neutral-colour check in a more formal, tonal look with tailored trousers and a lightweight jacket. For warmer days, a short-sleeved check is a great option: “Being bold with check catches everyone’s eye – a bright red or mustard madras short-sleeved shirt with a pair of light wash jeans will have you looking on point this summer,” says Rebecca Langrish-Smith, a stylist at River Island’s Style Studio. The suit, a no-brainer. You could lean towards a lighter grey Prince of Wales check in the summer and keep the navy, charcoal and tweed styles for winter, but they’re all good year-round options. With strong checks, keep the rest of your attire muted and clean (think classic white shirt and a plain knitted tie for texture), while with less obvious checks in grey and light brown cloths, a bold striped tie can make a big statement. Staying with the tailoring theme, a double-breasted check blazer is a go-to smart casual piece for summer and winter alike. Think Don Draper at a garden party. Take a simple white or navy T-shirt, tuck into some high-waisted pleated trousers with a turn up and go for classic shoes such as loafers and monk straps for a polished finish or dial it down with minimal sneakers. The buffalo check overshirt is a straight-up casualwear hero. The classic colourway is black and red but keep an eye out for plenty of other iterations that dive deeper into the colour wheel. Again, a simple white T-shirt underneath adds a little Steve McQueen factor to your upper half, while from the waist down you can complete the rugged look with worn-in jeans and your favourite kicks, or even some Chelsea boots. This is an often overlooked rule, but your physical proportions should have a hand in the size of the checks you choose, particularly when it comes to suiting. Small, compact checks will make large guys look even larger (and we don’t mean taller and more muscular here), whereas if you’re short and slight, huge windowpane checks will make you look like whitebait caught in a drag net. If in doubt, a Prince of Wales check is almost always a perfect middle ground. The key is to vary the size of the checks and keep the whole outfit tonal in colour. Ronald Reagan was once lambasted for wearing a Prince of Wales check suit on a presidential trip to the UK because it was deemed too casual. Thankfully, the relaxed approach that designers are now taking to tailoring means PoW would come under no such scrutiny, but you should still be mindful of the dress code. “Given their perception of flamboyance, checks should be avoided on the most formal of occasions and you might want to think carefully about pimping the windowpane out at work, especially if your boss likes to play it safe,” says Thompson. Nothing says “you’re not long for this job” more than looking more impressive than the man who pays your wages. Note, some of the strongest street style looks we witnessed at the recent shows saw Balenciaga Triple S sneakers, track pants and check coats fused together like long-lost friends. Check trousers are easy if you happen to be a goth-punk tartan type who well and truly lives the look. For the rest of us, there are rules to follow. Pick out a secondary colour from the check and use that with block-colour knitwear on your upper half for a harmonious look. Or, if you’re brave enough to clash patterns, make sure there’s a contrast in either the size or the direction and tie it together in a tonal look, says Down. “I’d strongly advise ensuring one consistent colour appears to varying degrees in each pattern to pull it all together in a subtle but significant way.” In other words, check yourself before your wreck your look.